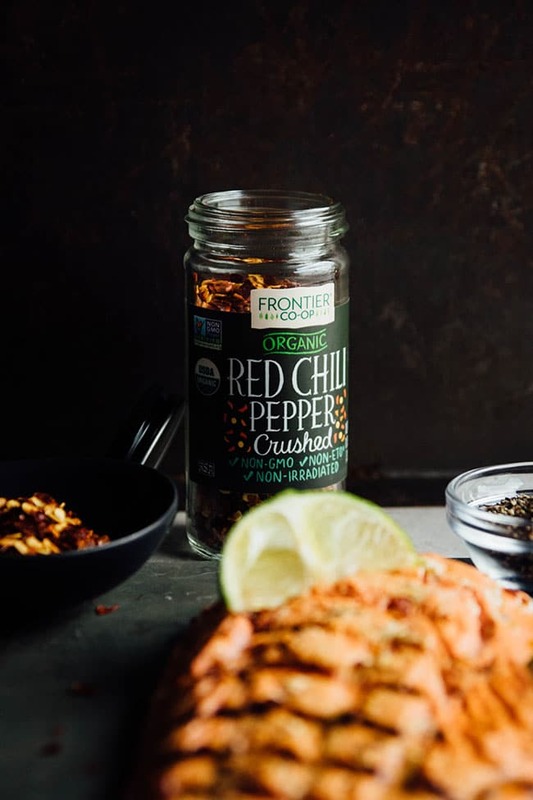 This post is sponsored by my friends at Frontier Co-op as part of their #CookWithPurpose and #GrillTheGoodness campaign. 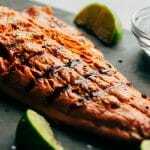 This easy grilled salmon is bright and delicious with a two-minute marinade – perfect for summer grilling and busy weeknights alike! 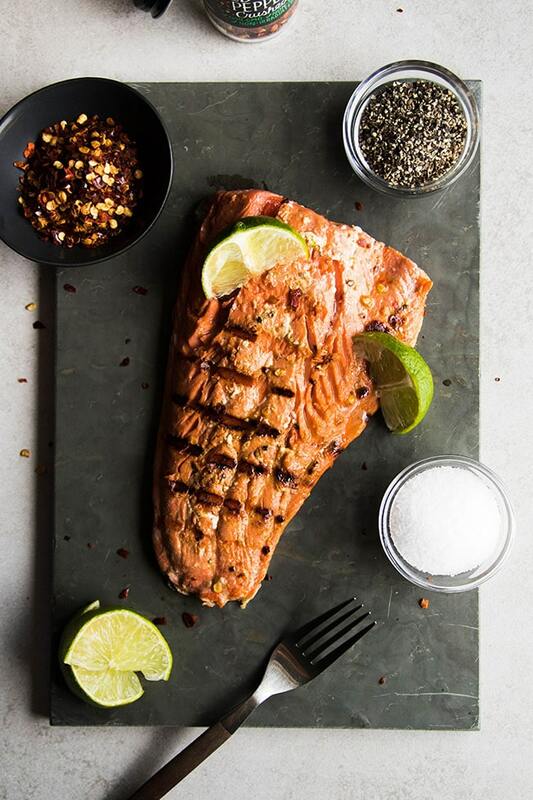 Busy weeknights, meet RIDICULOUSLY SIMPLE GRILLED SALMON. We’re working with a two-minute marinade here: olive oil! lime! soy sauce! garlic! crushed red chili pepper! salt and pepper! BOOM. End of list. There’s a little heat. A little zing. A little garlicky zip! My faaaaaaaave. And, okay, I am the ACTUAL WORST at flipping fish on the grill. I have no patience for the whole “waiting for it to cook” thing. But even I, terrible-grilled-fish-flipper, am about to put this grilled salmon on REPEAT. (Orrrrrrrrrr, you could totally just bake this and skip the grill altogether. If you’re into that sorta thing). They’re a co-op! That means they’re member-owned (in this case, by their wholesale customers). They take environmental stewardship seriously. 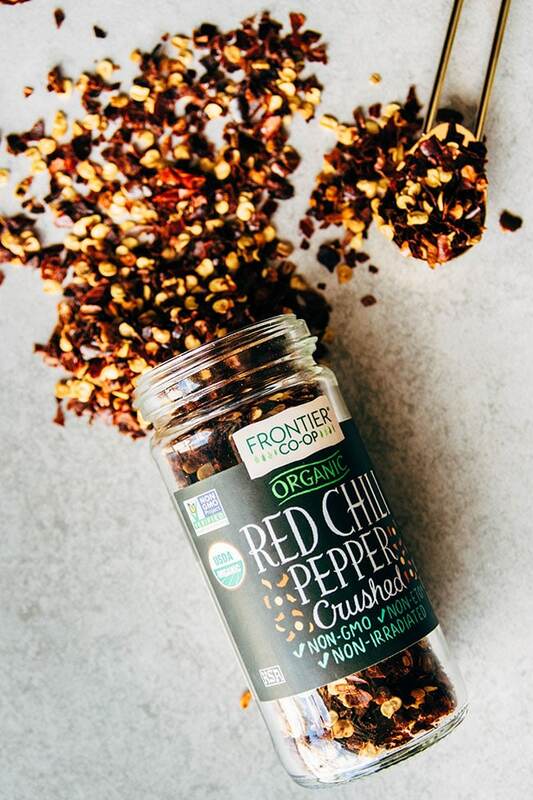 Hip hooray for sustainably sourced, organic spices produced in energy efficient facilities! They work personally with as many of their growers as possible to build sustainable partnerships that support communities around the world. They love their farmers! Frontier has helped their farm communities dig wells, send kids to school, feed hungry children, and build training programs to help farmers learn and grow. An easy weeknight salmon recipe with just a few ingredients! Lay salmon in a small baking dish (I like to use a glass container with an airtight lid) and pour the marinade over the fish. Turn the salmon to coat and make sure it’s covered in marinade. If you have skin on the salmon, place the filet skin side up so that the marinade can soak in. Cover salmon with the airtight lid and store in the fridge for thirty minutes to an hour or until you’re ready to eat. Heat a grill pan over medium-high heat until it’s piping hot (you could also use your outdoor grill). Use a heat-resistant pastry brush to brush olive oil over the grill grates to prevent the fish from sticking. Remove fish from marinade and place it on the hot grill pan. Let it cook – without touching it! – for 5-7 minutes (see recipe notes) until salmon has lightened in color. Use a thin spatula to pick up the fish and flip it over on the grill. (If you’ve oiled your grill, the salmon shouldn’t stick too much once those nice grill marks have developed). Cook for another 5-7 minutes until fish is cooked to your desired level of doneness. 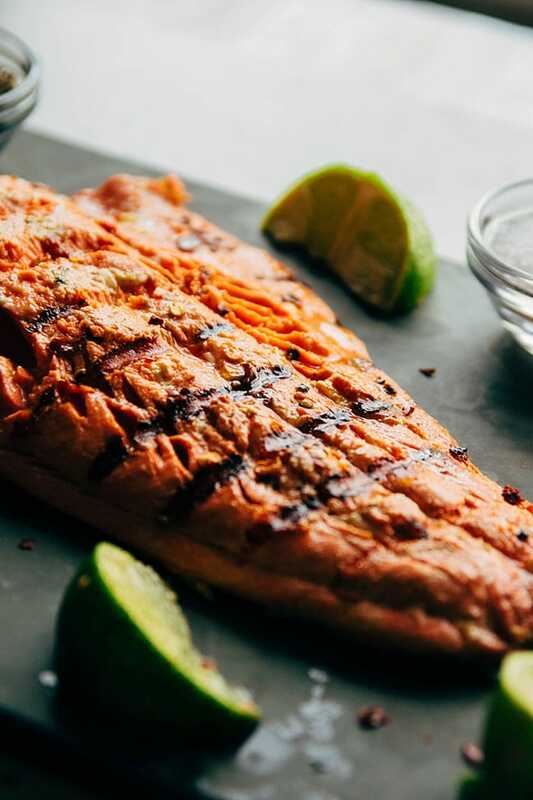 Remove salmon from the grill and serve immediately with extra lime wedges (optional). You could also add an extra sprinkle of flaky salt or red pepper flakes to the fish if you like. Cooking time will vary depending on the size of your fillet – look for a piece of salmon that’s uniform in thickness to help it cook evenly, and don’t be afraid to cut into the fillet to take a peek at the fish! If you are cooking your salmon in small portions as opposed to one large fillet, you may want to decrease the cooking time. This marinade is also great on shrimp and chicken! Taste the marinade before you add too much salt here – soy sauce and salmon are naturally a bit salty, so taste and add seasoning as necessary! 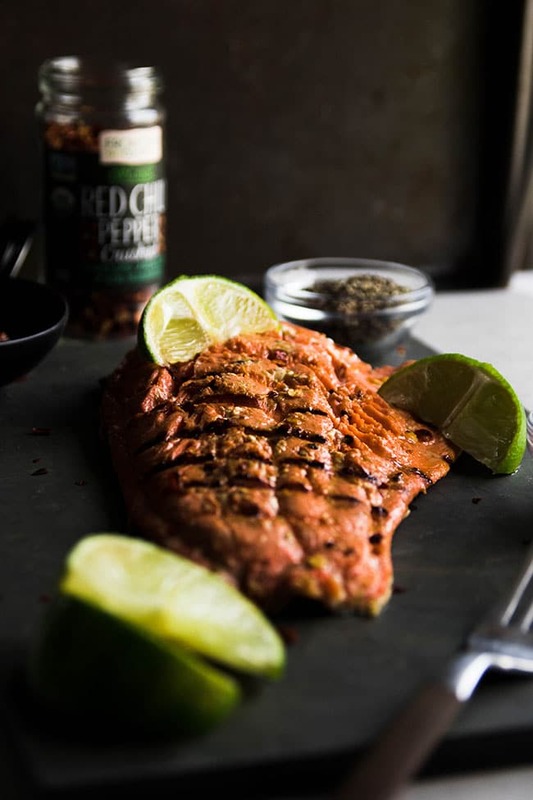 Don’t be alarmed if your salmon lightens in color a bit after you’ve let it soak in the marinade – that’s just the acidity of the marinade at work! You could also marinate the salmon in a large ziploc bag if you like, or use plastic wrap to cover the baking dish if you don’t have a lid. No grill? Roast the salmon in a 400 degree F oven for 12-15 minutes or until it’s cooked to your desired level of doneness. I choose Wild Alaskan Salmon because it supports family fishermen and comes from a sustainably-managed fishery. For a spicier salmon, add more red pepper flakes or a dash of hot sauce to your marinade (I like Sriracha). 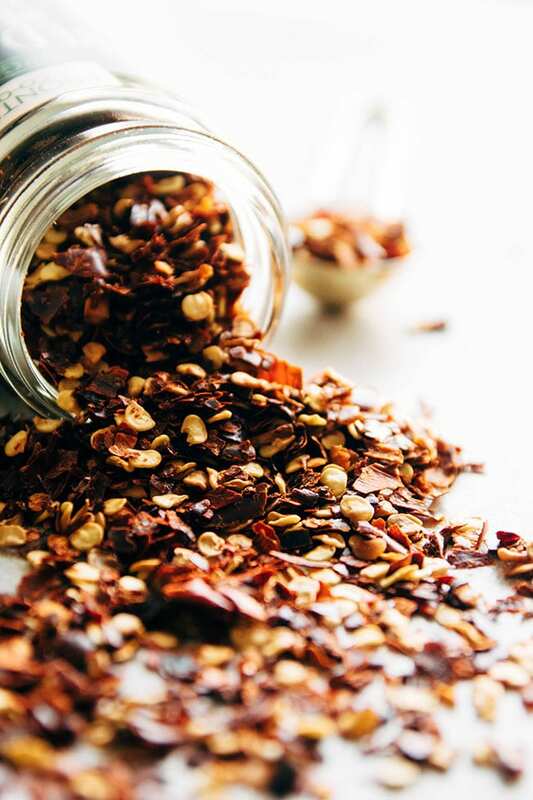 For a milder flavor, use fewer red pepper flakes. Add a drizzle of honey or maple syrup to your marinade for a hint of sweetness if you like. I don’t like to marinate my salmon much longer than an hour, because I like to let the natural flavor of the fish shine through. If you’d like to make a component of this dish ahead of time, you can mix the marinade and store it in the fridge on its own until you’re almost ready to cook the salmon. Great recipe!!! Super easy, super tasty!! Also my new favourite salmon recipe. Hey MJ – Awesome News! Thanks! Simple to make and delicious! The red pepper flakes add a subtle amount of heat. This has become my favorite salmon marinade. Hey Pat! Thanks for this comment! 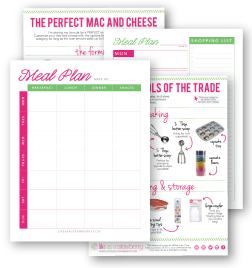 It’s wonderful to hear how a recipe can be easily changed to fit your dietary needs! This is also beneficial for other readers. Haven’t grilled salmon before. Will have to try it. My husband will love the spice. Thanks, Linda! I hope you love it! I can’t wait to make this recipe this weekend! It looks delicious! Thank you so much, Jenny! I hope you love it! Definitely have to try this. Loving the heat!